The movie world is full of equine stars, some of which are animated. Maybe you grew up watching these animated equines, or maybe you have a child who is learning to love these fun characters? Here is a list of some of the most popular animated equine movie stars. 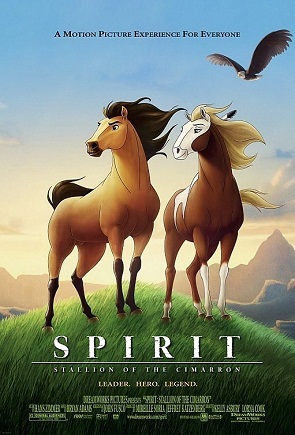 Spirit, the buckskin Kiger mustang stallion, and Rain, the pinto mare, make a great pair in “Spirit: Stallion of the Cimmaron.” Spirit, mischievous, curious, and brave, falls in love with the beautiful Rain, and the two are launched into an incredible adventure during this 2002 DreamWorks film. The film brings with it messages about the plight of the American mustang and how human encroachment has threatened the wild horses. The 2012 Disney Pixar film “Brave” was praised for its strong female heroine, Merida. Merida's faithful (and large) mount is Angus, the lovable black draft horse who may have been based on a Shire or Clydesdale. Angus is loyal and accompanies Merida on her many adventures. Sometimes stubborn, sometimes silly, Angus is everything that a young girl would want in a horse. Though not quite the star in the 2001 DreamWorks film “Shrek,” Donkey is a wonderful character sure to make anyone laugh. Full of spark and attitude, his commentary and larger-than-life personality earn him a spot in the hearts of many horse lovers. Our horses give us the wings we lack, and in the 1997 Disney movie “Hercules,” Pegasus lends those wings to Hercules, literally. We've all dreamed of a flying horse, and who wouldn't want a ride on Pegasus, despite his moments of fear and silliness? We have to finish up the list with the wonderful Philippe, the large draft horse who accompanied Belle in the 1991 Disney movie “Beauty and the Beast.” Philippe's expressive actions and kind nature made us immediately fall in love with him. Wouldn't you love to have some of these fine equines in your barn?